Liverpool’s FA Cup elimination at the hands of Oldham on Sunday was the 119th time in the Premier League era that a Premier League side has been knocked out of the Cup by opponents from a lower division. And it is Liverpool who have suffered this fate more than any other team: eight times now. The defeat at Oldham put them one clear of their Merseyside rivals Everton in the ignominy stakes. Everton are on seven currently – and with Oldham to face next! Of course football stretches back before the Premier League, and well done to all those who point it out. Jolly good spot. Those of us who started watching games at a time that was closer to the second world war than today know this. But the cut-off does seem apt for this exercise (and many others) because of the departure of the game in an entirely new direction after 1992, since when the gulf in financial resources between England’s top division and the rest of football has grown ever wider. And that is why a study of Premier League exits in particular is relevant. Newcastle and Sunderland have suffered the next most exits from the Cup as Premier League teams to lower opponents (six each), with Leeds, Southampton and West Ham next (five each). 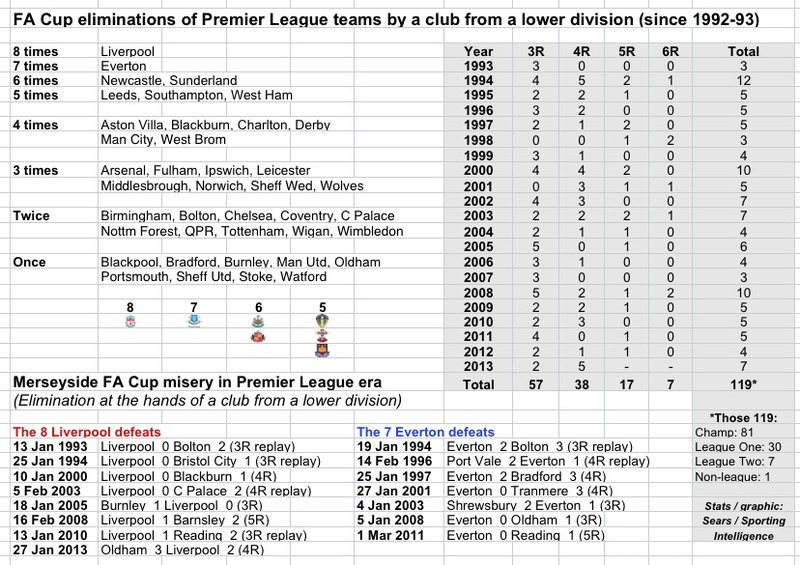 There have been 119 such exits and the number of times each Premier League club has suffered one are detailed in the graphic at the foot of this piece. Note that this weekend’s five such exits in the fourth round alone was last matched in 1994, when there were 12 Premier League teams thus scalped that season in the Cup as a whole. The seven Premier League teams giant-killed this season so far already beats the total number in each of the past four seasons in the whole Cup. It has been well documented that Luton are the first non-league team to eliminate a Premier League team from the Cup. (The last non-league team to eliminate a top-division team were Sutton in 1989, beating Coventry). But, for the record, the league origin of the 119 sides kicking Prem teams out of the Cup are: 81 clubs from the Championship or equivalent, 30 from League One of equivalent, seven from League Two or equivalent – and Luton of the Conference.